Members of the Focus E15 campaign used the occupation on Stratford’s Carpenter’s Estate next to the Olympic Park to try and shame Town Hall bosses over leaving “perfectly habitable” homes empty for years. They accused Newham Council of shipping families from the estate out of London, leaving homes vacant in site of the Olympic Stadium. “The estate has 2,000 empty council homes due to the decision to sell off the land to a private developer,” said Focus E15’s Jasmine Stone. This weekend, while commentators yawped on about local democracy, and Ed Miliband vowed he’d close the chasm between the rich and the rest of us by a whole couple of centimetres, a bunch of young women in east London just got on and did it. They began with a Sunday afternoon fun day, the mothers laying on facepainting and some Sister Sledge. What jarred was the location: the Carpenters estate, next to the Olympic village, was long ago cleared of most of its residents as Newham council tried to flog the land. Except the last deal fell through, leaving around 600 council homes empty. This is in a borough where more than 24,000 households are waiting for somewhere to live, and where, last winter, the shopping precinct was full of rough sleepers. 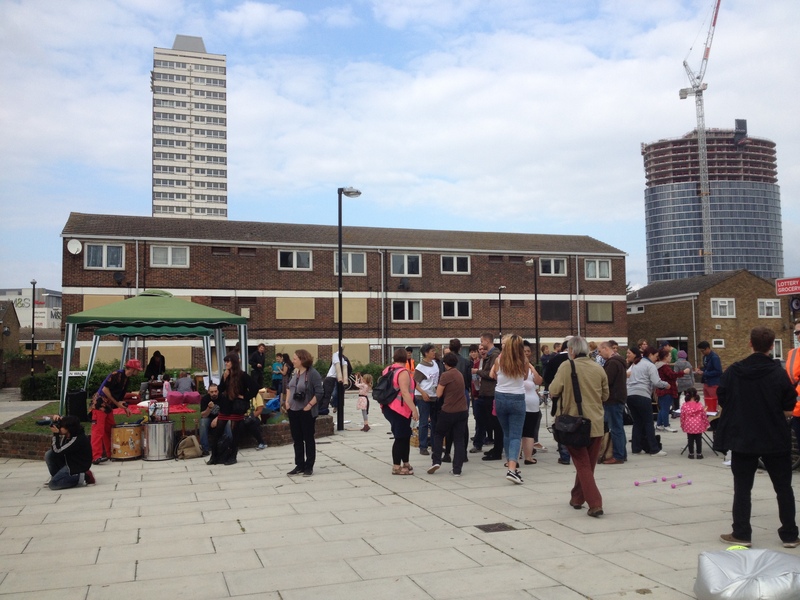 Amidst a ‘Fun Day’, organised to celebrate the one year anniversary of the campaign, supporters of the campaign occupied four properties on the Carpenters Estate, which the local Labour council has earmarked for demolition and redevelopment. With Newham’s Labour Mayor away at the Labour Party conference, an occasion which saw Labour Shadow Chancellor Ed Balls reassert Labour’s commitment to savage service cuts – ‘balancing the books’ -, what better time to step up the fightback against cuts, social cleansing and gentrification? They also put this video together of the day.. The party atmosphere at the community event was in stark contrast to the boarded up houses that looked down upon it. However, amid a drum roll and loud cheers a ribbon was cut to announce the opening of a four-flat block. The campaigners said they will clean up and reuse the space to hold workshops to highlight the plight of those being left behind by the government’s ideologically driven policies including austerity and to educate one-another on how to fight back. E15Focus mum Sam Middleton tells Kate why we occupied the flats.